Perch width would fit a normally sprung medium duty and will work for the front. But I have air ride on the back (and want to keep it) so I will have to move the mounts on the one that goes on the rear. Luckily there are a few guys on Pirate that are playing with these and have sorted out the materials and what to weld them with. Couple that with the next door neighbour being a certified pressure welder for nuke plants. I do have some 8” x 3/4 billet plate to use for mocking up if timing doesn’t work for him helping with the initial fab (probably air arc off the perches and remount them 2” further out). The other good news is that the trolley out the back has the same rear axle as this truck so I may be able to pull it to use to jig everything up. How many people can refer to "the trolly out back"... ? Good news on the front axle. Rear axle should be fairly straight forward. I think you have a great plan and I can't wait to see it come together. You might even be one of the first to start an Axle-Tech axle swap and actually complete it. I've seen several started on PBB and have yet to see one completed. 4 days into a 4 hour job and I finally have 1 axle pulled to bits. And how is this for a good size 3rd. Took the best part of a day to make a kingpin puller. I found out 1/2 way through that There is a guy in Canada who sells them as a kit. Those are 5/8 bolts and 1/2” plate. if you look close the 3rds may have fork lift tabs. They do on rear of my Meritor axles. we were able to just pull the third straight up out of the axle with the fork tongues under each tab. took a little jiggling and joselling but not too much. putting a 2x4 chunk under each tab and a cross brace or strap to clamp each 2x4 against the 3rd ... along with a few well placed eyebolts might get you same result with an engine puller/picker. Great job on the axle tear down. I have another question, how is the transfer case ranges controlled? Again, can't wait to see this portion progress. Transfer case is air controlled. It is AWD with 30-70 until you apply air to one port the 5-50. Another port controls the lo-hi with air needing to be applied to engage low range. Plus there is also a PTO drive. I do need to check though as I believe it is possible to actually put the transfer case in neutral. Which means I will need to either put a parking brake on the disks or the pinion rather than the output of the transmission. Air will be nice. I couldn't imagine the challenges of a stick shifted t-case on something like that. I just read it and caught up to the end! Great progress. 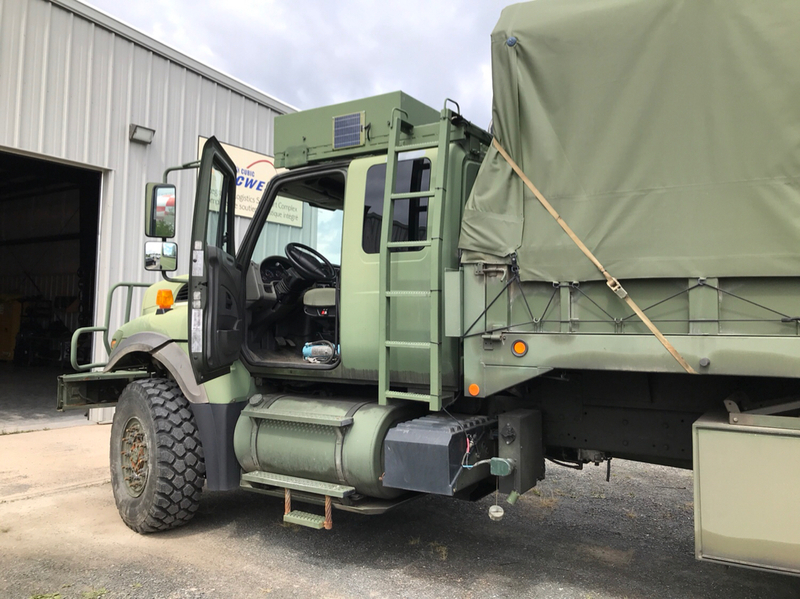 I've also been looking into M2 106s in crew cab 4x4 cab and chassis or flatbeds/haulerbeds. They're rare and pricey. I also debated getting a 4x2 and swapping in an axle. Work and Phoenix weather have put progress on hold. But I do have the axles apart with new centers on the way. Hopefully I will do the mods to the spring hanger mounts by October and then start on the 4WD conversion. But I did get to play with a couple of these. Some days I love my job. That's sweet, what are the specs on that rig?